Ever since re-opening in 2013, the WasserWelten Krimml have attracted around 40,000 visitors a year from all over the world, making the modern visitors’ centre dedicated to water and the Krimml Waterfalls one of the most attractive sights in the province of Salzburg. Plan your easy journey with your own car, the Pinzgaubahn trains, bus or taxi. Parking for cars and motorbikes and the bus station are located directly at the WasserWelten Krimml. 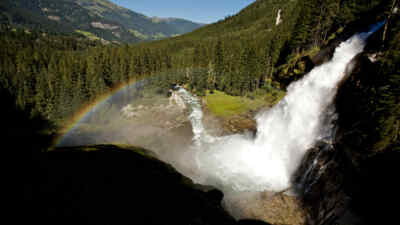 First park on the P4 grounds, then visit the waterfall centre, where you can buy the affordable combined ticket and where you get the blue coin for P4 grounds and visit all attractions of the WasserWelten Krimml and the Krimml Waterfalls. The info folder, which you will receive at the pay desk, gives you a quick overview of the entire area. Waterfall centre with underwater adventure world Aquaszenarium, view terrace with waterfall view, gastronomy WasserWunderBar and shop with numerous souvenirs and delicacies from the Pinzgau. 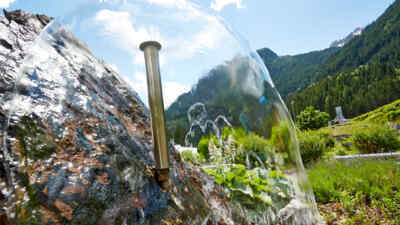 Haus des Wassers: exhibition with exciting experiments, information on the Hohe Tauern Health initiative, WasserKino interactive cinema and Swarovski telescope for an accurate view of the Krimml Waterfalls. Aquapark outdoor area with interactive character Aquamax, aqua foosball, water festoon, game and experiment stations, and a Kneipp facility for all ages. Visiting the multimedia WasserWelten Krimml is a special experience for the entire family. Plan a daytrip during your holiday in the province of Salzburg! The entire site is open to you and your loved ones every day from 9 am to 5 pm (final admission at 4.30 pm) – the combined ticket even includes parking on the P4 grounds. Look forward an all-round experience all about water with many new, exciting and unique indoor and outdoor options. We wish you a good journey and an adventurous stay at the WasserWelten Krimml!